I think it was around 1974 when I first heard Sonny Terry sing that lyric. And it struck me like a bell clapper and I actually took his words to heart. I believed him. Crossharp harmonica was rightfully his (i.e., black), not mine (i.e., white). So instead of continuing to take myself and my playing all so seriously, I started viewing it as something to play with in a “nothin’ special” sort of way; as something OK for me not to “chain” my identity to. As the years went by I continued to play off and on; and I also moved on. I got a job; got married; finished school. Had kids. Bought a house, then another. The whole 9 yards. I think that’s the difference between me and a lot of other harmonica players who crossharp got its hooks into. They had no choice. But I did. Thanks, Mr. Terry, for giving me that. 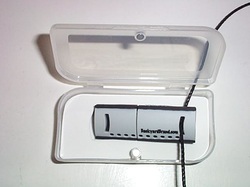 I actually think my rather contrarian perspective on the harmonica is why I felt free to “feel” the idea for my patented FlashHarp® when it hit me. What did that feel like? It felt like I’d just found a way to put the harmonica back on a plane everyone could relate to again instead of putting up on a pedestal (like those dudes in mirror sunglasses and biker garb do). It also felt like I might be setting other new harmonica players free from feeling like they had to take themselves and their harmonica-playing too seriously, too. In sum, FlashHarp nicely expresses my personal belief that We, The People—and "It, The Harmonica"—are all better off when our “nothin' special" status is restored. I further believe that way of interacting with the harmonica is the right way for opening up new minds to the instrument; i.e., innovative people who might get musically hooked on playing, one day, too. Which flash drives will be collectible 15 to 16 years from now? Oh, they're going to be collectible, that's for sure. But not just any flash drive will do. Beyond designiness, the "collectible" will need to demonstrate uniqueness and rarity. A bona fide "dual purpose," will be nice, too. Most of all, artfulness, utility, craftsmanship and unique content will be sought. 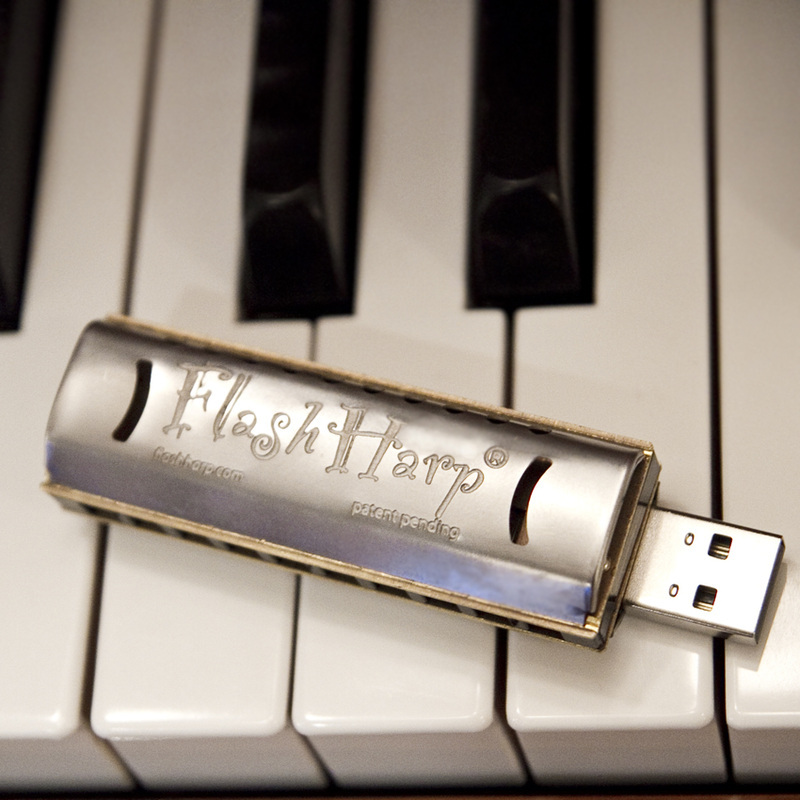 All of which are present in the FlashHarp®. Watch the little man dance! Learn to play crossharp by following along! Model Music-Making for Your Kids! When I grew up, my dad had a dream for me—that I would become the next piano prodigy. Problem was, he never played an instrument. In fact, he listened to very little music, himself. Naturally, he never got his dream. I never glommed onto the whole piano-playing thing. Instead, I grew up to be a harmonica player. Flash ahead a million years... Now, I've got kids of my own, both of whom are fine musicians. But I never said a word to them about playing an instrument. What did I do, instead? I modeled music-making. The whole time they were growing up I was walking around harpdoodling all the live long day (and night) on my harmonica. Result: My kids just grew up naturally believing that playing some kind of musical instrument was something one just does. So one day, one of my kids said, "I want to play violin." The other child followed suit. Naturally. She actually does play the piano, and quite well, I might add. Moral of the story: It's not important how well you play. The important thing is to play. Your kids will model their behavior after yours. Try it and let me know how it works!